In Honce-the-Bear, King Aydrian Boudabras wakes in a cold sweat, his conscience haunted by those he has killed to garner power, including the rightful king before him, Danube, his mother’s husband. Now Aydrian is preparing his armies for war, forging loyalties, playing one adversary against the other, and giving those around him barely a glimpse of his remarkable powers. Even Adyrian does not fully understand what drives his ambition, the guiding voices he first heard from the shadow of Oracle, or the truth of his birth in the elven land—before it was stained and mortally threatened by the demon dactyl. But as the lands run with blood, there are no adversaries like a mother and her long-lost son. For Jilseponie, once queen of Honce-the-Bear, has discovered the truth of her son Aydrian’s birth. 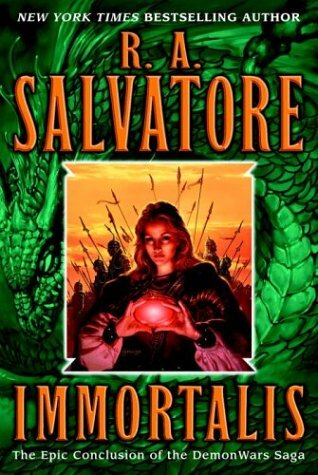 And now she becomes the only mortal on earth with magic enough to stop her own son—by any means necessary—from his cataclysmic quest. . . .
At the conclusion of the Second Demon War Saga's dual expositions, Ascendance and Trancendence, the stage is set for Imortalis--R. A. Salvatore's thunderous third act. Young King Aydrian has usurped the throne of Honce-the-Bear with the villainous Marcalo De'Unnero at his side. Simultaneously, in the desert lands of Behren, Brynn Dharielle has used political machination and her monstrous ally--the dragon Agradeleous--to free her people, the To-gai, from the Yatol yoke. Aydrian seeks to secure his throne and expand his kingdom into the lands of Behren. His strength and cunning bring him to brink of success, where he meets the heroes of the first Demon War Saga, including his mother Jilesponie, and the Dragon of To-gai, who must unite against impossible odds to save the world.